My soon-to-be 92 year old Granny just moved from the condo she's lived in for the past 12 years, into a very nice assisted living home. A minimalist by nature, she relishes a move for its inherent excuse to pare down, to get rid of things. Even if they're still potentially useful, like this necklace. 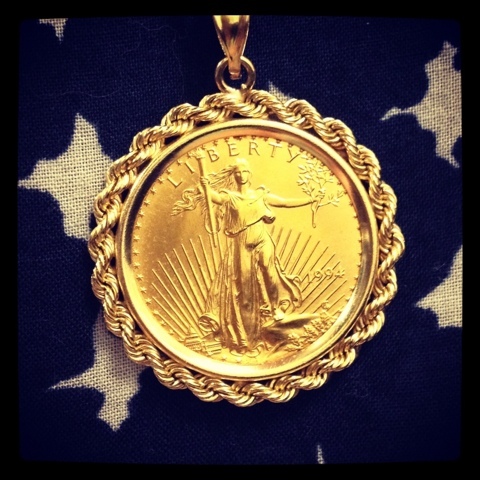 She's been wearing this gold coin necklace as long as I can remember. Apparently though, "as I long as I can remember" is 1994, which is the year on the coin I'd never noticed before. When she gave it to me (the timing of which I did protest, since she could easily still wear it), I asked her to tell me the story behind it; where she got it, why she bought it, etc. "I bought it for myself because I liked it." And why not? Sometimes, there's no better reason.